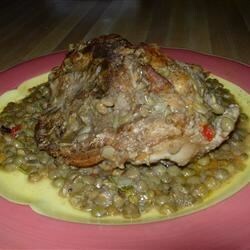 "Moist, flavorful chicken breast with a delicious side of lentils. I suggest serving the lentils over a bed of arugula with the chicken breast on the side. Whatever you do, do not leave out the lemon juice." Season the chicken liberally with seasoned salt. Heat oil in a large skillet over medium-high heat; add chicken and cook until well browned on all sides, about 10 minutes. Remove chicken from pan and set aside. Lower the heat, add the onion, and cook and stir until translucent, about 5 minutes. Stir in the garlic, carrot, and pimento, and cook and stir an additional 3 minutes. Pour the chicken broth into the pan, and bring to a boil while scraping the browned bits of food off of the bottom of the pan with a wooden spoon. Stir in the lentils, rosemary, wine, and vinegar. Return the chicken to the pan; simmer until chicken breasts are no longer pink at the bone and the juices run clear, about 20 minutes. Remove from heat; stir the lemon juice into the sauce and serve. Excellent flavor. My kids are not crazy about lentils. I also felt it could use a few less lentils. This recipe has been updated with a correction from the submitter. The recipe now calls for a package of steamed lentils, not uncooked lentils. This was delicious and easy to make! I didn't have Lawry's so in place I used Mrs. Dash/Chicken. I will keep this recipe! Thanks for sharing! Really enjoyed this recipe, The kids both ate it all up. I did not add the pimento since I had none. Will make again. Everyone loved this. I used some extra homemade chicken stock and everyone had a bowl of soup as a side dish!